When our team member Abby raved to us about the new chocolate she was eating, our ears perked up. I can speak for our whole team when I say we love chocolate. And Abby’s recommendations seldom if ever disappoint. So we ordered a box for the office and sure enough, our taste buds danced with joy. Not only that, our curiosity was peaked. We wanted to learn more. We gave the chocolate company’s founders Jordan and Jason a call and asked if we could come see where il Morso is made. After all, their factory is on Treasure Island, just a few miles away from our Berkeley office. Not to mention that on a clear day, the views there are pretty stunning. So on a sunny summer Saturday, we paid il Morso a visit. Here’s what we learned. When you pop an il Morso bite into your mouth, it feels like chocolate—silky, melt-in-your-mouth chocolate. 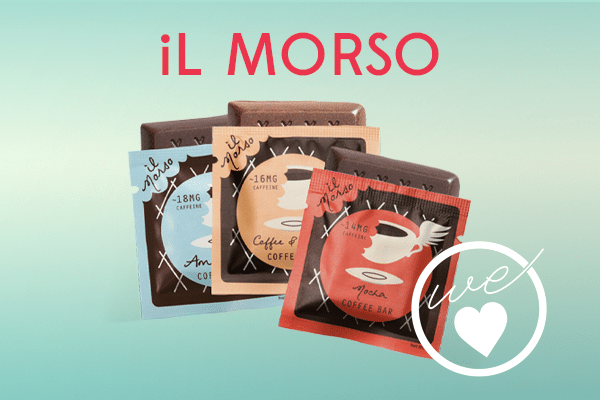 Il Morso is not coffee-flavored chocolate, and it’s not a chocolate-covered espresso bean. This, my friends, is a whole new way to enjoy coffee. Essentially, and I’m not leaving much out here, Jordan and Jason take organic coffee beans and put them in the same machine and use the same process that you’d use if you were making chocolate. The result is a coffee bar you can pop in your mouth and enjoy like chocolate. Oh, and that sugar that I mentioned is in there? Only 1 gram per morso. But Shouldn’t I Be Avoiding Coffee? There are definitely good things and bad things about coffee. I interviewed Kevin on this topic a couple months ago (you can watch that interview here). But a lot of what’s bad about coffee actually has more to do with how it’s grown and processed than any inherent characteristic of the bean. For one, when you buy a cup of coffee, it’s sort of a gamble as to whether you’ll get a light boost of energy or a sweating, shaking, power plant explosion followed by an agony-filled crash. Or is that just in your head? It’s not. In fact, Jason tells us that a 12-ounce cup of coffee from Starbucks can range from 50 mg of caffeine to 160 mg. That’s a big difference! So one thing we love about il Morso is that the amount of caffeine is displayed prominently on the label—their Americano has 18 mg (the most) and the Green Tea flavor has 7 mg (the least). This gives you the opportunity to get a sense of how much caffeine your body likes, and where it gets to be too much. Something else that makes coffee questionable (which we also talk about in the interview with Kevin) is that, similar to peanuts, this crop is prone to mold toxin. Some of the negative effects of drinking coffee, like stomach upset, are likely related to toxins present in some roasts. You want coffee grown organically, with care. And you want coffee made from beans that all come from the same place. Since they work with so few ingredients, they’re able to be really adamant about choosing the absolute best source. Everything is farm traceable, and they work only with 100% organic ingredients, either fair trade certified or committed to ethical business practices. So once your caffeine buzz wears off, you’ll be able to sleep soundly knowing these treats are intentionally sourced. The space they work out of is as unique as their product. It’s shared with a couple other food makers, as well as artists working on huge art installations, some made of metal and colorfully illuminated. You feel a creative energy when you walk in the door. We hang out outside, amongst a cluster of shipping containers, while we ask them question after question. Jordan tells us about his epic search for the machine he uses to turn coffee beans into chocolatey liquid. What they’re doing is new, and didn’t come with a set of plug-and-play instructions. A lot of it was pieced together with trial and error. They’re small, with just one machine, four flavors, and five team members. We’re excited to be getting to know them so early on in the company’s journey. We leave with a bag of morsos to take back to the office and a slight caffeine buzz. We live in a world where convenience matters. It’s good to slow down and smell the roses, but the reality is that we’re busy. And sometimes that’s okay! What we love about Il Morso is that it comes with you. On the bus, in the car, in your desk at work, in your purse… Il Morso doesn’t spill and it doesn’t need a cup. It’s your organic coffee fix when you need it most. Oh, and did we mention there’s a matcha green tea flavor? 4 Flavors: Which One is For You? Vegan: the Americano flavor has no milk powder (the other three do). Chocolate lover: Mocha has organic 70% chocolate, giving you a classic coffee and chocolate flavor. Team tea: Not into coffee? Their Matcha Green Tea morso gives you full matcha flavor with a touch of sweetness. Really nice for an afternoon treat that’s very minimally caffeinated. Classic cup of joe: Like your coffee with a little cream? They’ve got you covered. Every month, something new: sustainable, organic, otherwise revolutionary. Subscribe to stay in the loop. Thanks for letting us know, Dee! When I click on Il Morso link, my fireforx warns me that this site is not secure. So I dont think I will be entering my credit card info here!!!! This is a standard security message that sometimes pops up when you go from an https site to a http site. No need to worry!